The PhoneBrella is the Bluetooth® accessory you never knew you always needed. 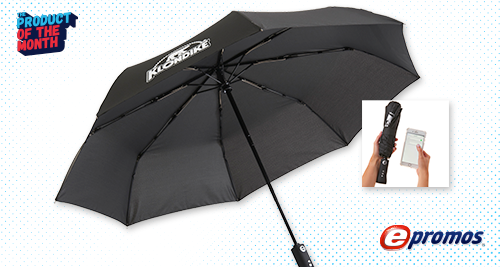 Forget fumbling to find your phone while holding an umbrella. With the PhoneBrella you have a hands-free solution to getting caught in the rain. Bluetooth technology is an unstoppable force that is fueling both the retail and promotional worlds. Stay connected without being physically connected. Wireless is where it’s at. What better way to show your customers that you are keeping up with the latest trends? The PhoneBrella is a revolutionary product that features Bluetooth technology built into the handle of an umbrella. What does that mean exactly? Well, quite simply, it means your customers can sync their phones to answer calls or listen to music without struggling to hold both their umbrella and their phone. The speaker and microphone are built right into the handle of the umbrella. Just like a Bluetooth device for your car, you’ll hear your phone ring from the speaker. To answer the phone call, press the circle button. When the call is over, press the circle button again to end the conversation. The PhoneBrella also allows you to listen to music through the speaker on the handle. With the two triangular buttons (above and below the circle button) you can easily skip and repeat songs without going back into your phone. Aside from its awesome Bluetooth capabilities, the PhoneBrella also features an auto-open and auto-close feauture so you never have to struggle with a stubborn spring again. The large button with up/down arrows toward the top of the handle will release and expand the umbrella, and when you’re done it will also retract and collapse it quickly and efficiently. When closed, the entire length measures 13.5″ making it easy to fit in a briefcase, purse or backpack. The PhoneBrella currently comes in three colors: black, grey and navy. The nylon canopy offers a 46″ arc for excellent coverage. And the sophisticated retail packaging brings it all together. Screen print your logo on any panel or add additional imprint areas for maximum visibility. Why is the PhoneBrella a Must-Have Bluetooth Accessory? This unique product allows your customers to stay dry and use their phones while keeping one hand free. It’s so unique, in fact, the novelty in and of itself will have people talking about your brand. The PhoneBrella appeals to a wide range of customers. Golf-related businesses can hand these out at tournaments, as they are sure to come in handy if there should be rain. City commuters using public transportation to get to the office often walk in the rain from subway platforms and train stations. Imagine how freeing it would be to give these customers a hand – literally – with the PhoneBrella. College students who have to walk across campus can also see the value in having this innovative Bluetooth accessory. To top it all off, the PhoneBrella can actually send a reminder to your customers to take the umbrella whenever there is a high chance of rain! For an additional charge, your PhoneBrella can feature a hangtag for the Rain Alertz app attached to the handle. The hangtag provides instructions for how to download the Rain Alertz app for free using iTunes®, Google Play® or the Windows® Store. Once downloaded, the customer is prompted to enter a unique code, which can be found on the hangtag. The code is tied to your customized alert message and branded five-day forecast, which will display on their smartphones when the chance of rain is 60% or higher. The alert works off the GPS in the phone so no matter where your customers travel, they will see your logo for a subtle reminder of your brand anytime there is a high chance of rain. Make the PhoneBrella your newest promotional Bluetooth accessory today! Call us, the Promo Know-How People to incorporate this item into your marketing plan. Love reading up on our Product of the Month? Here’s our January issue in case you missed it. Want to see and experience more promotional product trends for 2019? Check out our album on Facebook, and while you’re at it, follow us on Twitter, Instagram, Linked In and Pinterest to stay up-to-date with what we’re promoting.